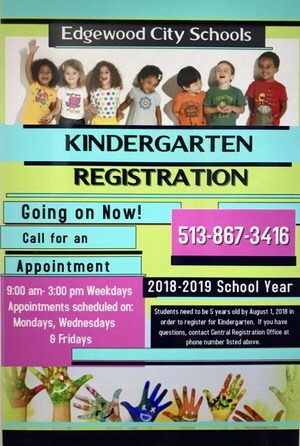 Appointments are now being scheduled for Kindergarten registration. Call the Edgewood Central Registration Office (513) 867-3416 to schedule your appointment. Call Monday- Friday from 9:00 am to 3:00 pm. Appointments are being scheduled on Mondays, Wednesdays and Fridays. Note: Preschool Registration has been scheduled at Babeck Early Childhood on Tuesday, April 17th @ 6 PM. Preschool spots are on a first come, first served basis. Students need to be 5 years old by August 1, 2018 in order to register for Kindergarten. Kindergarten and Preschool is offered at Babeck Early Childhood Center. Seven Mile Elementary offers Kindergarten; there is no Preschool at Seven Mile.